We often hear art and poetry spoken of as forms of thinking. That’s a simple enough proposition, but it begs the question ‘What do we mean by thinking?’ And what’s the difference, if there is one, between thinking something, and seeing it? The cartoonist Lynda Barry uses an expression I find helpful, here: ‘the unthinkable mind’. When we draw or write stories, Barry suggests, images behave ‘more like ghosts than ideas’, moving as if with a mind and a will of their own. And releasing that movement of images (which, for Barry, is synonymous with imagination) involves a mode of seeing that’s enacted by making, and is a quite different species of thought to discursive, analytical reason. A curious thing: the apparent inability of critical thinking to access this direct, responsive seeing. And something that Mervyn Peake once observed, that I often drift back to, is that learning to follow the thread of what you like is the discipline that best facilitates such seeing-by-making, whatever we choose to call it. To illustrate why Le Guin’s handmind appeals to me, and what I mean by seeing and liking in this context, I’ve brought a drawing project that was interrupted by another idea, one which grew up around it, like ivy taking over a tree. The first project: 1000 flies. 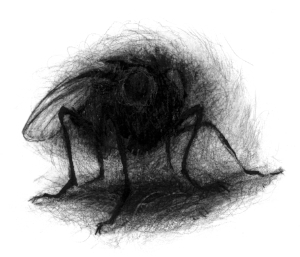 To draw a thousand flies. An idea seeded by hearing about the practice, begun in Hiroshima, of folding 1000 paper cranes as a form of peace-prayer, or ritual healing: Senbazuru. But long before I got to 1000, something else overtook this plan, something that eventually unspooled as a story called Fly Sings. Why did this new thread grab my attention? Most simply, perhaps, because drawing for its own sake no longer excites my interest the way it once did. Because drawing comes alive, now, as part of a broader process involving words, and the visual combination of words and pictures, in narrative form. Words, drawings, the behaviour of both on the page, their place within a sequence of pages, all acting upon each other such that none of these factors can be weighed separately. And drawing, as an output in its own right, now breathes most easily as a by-product, a spin-off of this storytelling process.